Mold Inspection Ontario CA. Protect Your Family And Pets. Call (909) 337-7900 Now! The Ontario mold remediation process can take a few days or so depending on where the mold is located and how much mold there is. Because mold spores are microscopic, mold cleanup needs to be meticulous. Mold is delicate and easily disturbed so the area containing mold damage must first be isolated. DryAgain Water, Mold and Fire Restoration Services uses heavy plastic to cover windows, air vents, and doorways. This helps keep mold spores from leaving the area when mold removal is taking place. DryAgain Water, Mold and Fire Restoration Services also uses special mold cleaning solutions and air machines to remove mold from the affected area. Mold damage can be caused by a variety of issues – leaky pipes, leaky roof, ventilation problems are just a few of those issues. Our mold inspection teams will pinpoint these issues so they can be taken care of as well. Reoccurring mold damage can do major structural damage to your home. Items that are heavily damaged by mold are removed from the home and disposed of safely. DryAgain Water, Mold and Fire Restoration Services will conduct air tests (mold inspections) to make sure the mold cleanup was successful when mold remediation is complete. 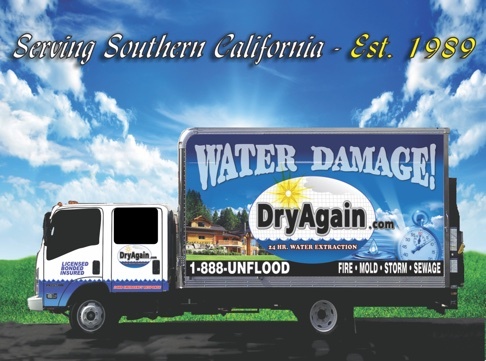 Call the professionals at DryAgain Water, Mold and Fire Restoration Services at (909) 337-7900 for more information today. Which Ontario Mold Inspection Company Is Right For Your Home? Time is of the essence when it comes to mold damage. Mold damage can cause problems to your home and your health. This is why DryAgain Water, Mold and Fire Restoration Services is available day and night to begin your mold inspection. Our full range of mold remediation services include mold inspections, air quality testing, air purification, mold removal, and any repairs needed to keep your home mold free. Our mold inspection staff is fully certified and insured. We use only the latest technology to make mold removal seamless. Of all of the Ontario mold remediation companies, DryAgain Water, Mold and Fire Restoration Services is first in quality and customer services. Our mold inspection services are guaranteed. Contact us today at (909) 337-7900. Our courteous customer service teams await your call!